The results from the NREFS project are based on a diverse set of methods but show a significant scientific and economic convergence on how best to respond to a big nuclear accident. Although it was treated as the prime policy choice at both Chernobyl and Fukushima Daiichi, mass relocation emerges as unlikely to be a good policy option. How do we cope when a nuclear reactor melts down and deposits a significant amount of radioactive fallout over the surrounding area? Exactly this happened at Chernobyl in April 1986. A quarter of a century later, another very large radioactive release occurred at the Fukushima Daiichi nuclear power station. In both cases, the authorities’ principal response for protecting the public was to move large numbers of people away from the surrounding area. A total of 335,000 were relocated after Chernobyl, never to return. After the accident at Fukushima Daiichi, 111,000 people were required to leave areas declared as restricted and an additional 49,000 joined the exodus voluntarily; about 85,000 had not returned to their homes by 2015. Were these sensible policy reactions? Was there an alternative? How should we respond to a big nuclear accident in the future? These were the questions behind the multi-university NREFS research study – Management of Nuclear Risk Issues: Environmental, Financial and Safety – carried out for the Engineering and Physical Sciences Research Council as part of the UK-India Civil Nuclear Power Collaboration. Using available data on the health consequences of these two severe nuclear accidents, the NREFS project has shown the responses to be excessive in view of the actual – as opposed to feared – level of radiological risk faced by the public. Based on the Judgement- or J-value method, between 5 and 10 times too many people were moved away from the Chernobyl area between 1986 and 1990, and the authors find it difficult to justify moving anyone away from Fukushima Daiichi, on grounds of radiological protection. Applying Bellman’s principle of optimality to determine the best decisions to be taken after a large range of big nuclear accidents, NREFS found relocation not to be a sensible policy measure in any of the hundreds of base case scenarios examined. After carrying out a review of current UK planning for a big nuclear accident the researchers examined, using Public Health England’s PACE-COCO2 program suite, the likely effects on the public of a severe accident on a fictional nuclear reactor located on the South Downs of England. Even after applying a rather strict safe-return criterion, they found that the expected number of people needing to be relocated is only 620, orders of magnitude below the figures for Chernobyl and Fukushima Daiichi. 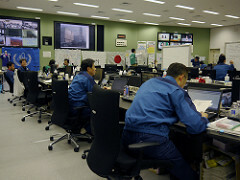 By contrast with relocation, the J-value method provided strong support for remediation after a big nuclear accident. Remediation and temporary food bans were similarly found to be likely components of any optimal economic recovery strategy.